This post was written in collaboration with Seeds Now. I only recommend products that I love and use in my own home. All opinions and pictures are my own. This time of year I am itching to trade my winter gloves for gardening gloves. We have had some glimpses of spring days ahead with unseasonably warm weekends here in the midwest, which has made me anxious for my spring garden even more. One way that I quench my garden thirst is to start my seeds indoors in February or March, about 6-8 weeks before the last killing frost. Each vegetable is slightly different so I make sure to look on my seed packet for specific instructions. A month ago we planned our garden for the year and a few weeks ago we ordered our seeds. Actually I should say my husband ordered our seeds this year, and I have to say, he went a little crazy. Bless his heart, but we have way more seeds than we will ever need. Let’s just say I have enough seeds to feed the neighborhood. If you are a beginner, be sure to go back and read about how to plan your garden. To start seeds indoors, you can go as basic or as advanced as you want. I like to use these great little expanding seed starting soil pods. They are so fun and convenient. You just add water and they expand. They already contain the soil you need, so all you have to do is plant the seed. Watching them expand is a ton of fun for kids (and adults). If you are on a budget, you could always use recycled containers like yogurt containers with some , washed out egg shells, folded up newspaper to make a cup, or really any small container and fill it with potting soil. You will want a tray to put them in though to catch water that drains. Beyond the container and soil, seeds need four things to germinate (wake up the seed) and grow: warmth, air, water, and light. This can be as simple as a warm room with plenty of lights or can be more complex like an indoor greenhouse. It’s up to your preference and budget for how fancy you want to get. There needs to be plenty of air circulation. This won’t be hard for you to do. Pay close attention to your soil. You want it moist but not too saturated. You likely will not need to water every single day, but it will depend on your growing conditions. Once a plant germinates and you start seeing green, those plants need a ton of light. Think about a bright sunny spring day. It is way brighter than your indoor lights so you will need lots of natural light or lamps. Both is even better. We have been putting our seeds in our sunniest window during the day and under lamps when it’s shady or in the evening. Don’t feel bad if you come across some roadblocks. I have been gardening for many years and still make some rookie mistakes. You likely don’t have enough light for your plants. Plants will search and search for adequate light and grow taller until they find it. We experienced this problem this year, and have come to the conclusion that our lights weren’t bright enough so we remedied that with more lights and plenty of bright natural sunlight during the day. You overwatered. Mold loves water and heat. So do plants, but if you water just enough you won’t get mold. If you oversaturate your soil, your plants won’t grow and you will get a moldy mess. Your seeds are either bad or they didn’t get enough of one of the items that we mentioned above. Not all seeds will germinate, but I have had excellent success with germination rate with Seeds Now. I love them! Lettuces and greens Note: It’s not necessary to start them indoors but I like to get a head start on my first batch. I like to practice succession planting, which means planting a few seeds every couple of weeks to avoid all of your produce coming in at one time. The rest of my lettuces and green are perfectly fine direct sowing. I hope this gives you all the tools you need to get a jump start on your garden by teaching you how to start your seeds indoors. Happy gardening! You mentioned succession planting for your lettuce, is this something you do with all of your seeds? I had a very successful garden for my first time last year, but was bombarded all at once with certain produce. I like the idea of succession planting to spread the fun out! I succession plant a lot. Plants like zucchini and tomatoes I don’t because they continue to produce fruit. Lettuces, greens and root vegetables that either only produce once or take a while to grow back, I succession plant. Do fluorescent bulbs do any good? Using those seed starting pods is a lovely idea. I’m usually recycling old newspapers, toilet rolls, different boxes for starting my seeds, but this is a great option too. I just finished with my seed starters and I can’t wait to start working outside in the garden. Happy gardening! Unsolicited third party confirmation here. 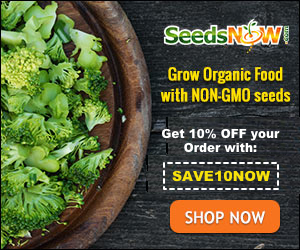 The germination rate of the seeds from SeedsNow.com are extremely excellent. I always receive great product and great customer service. The sampler packets (99 cents) are perfect for trying different varieties without breaking the bank. It’s heirloom and non-GMO seeds. I subscribe to the site and take advantage of the promos.